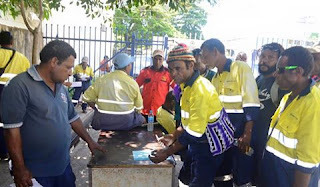 PNG Power workers today demand for stability within the State owned Enterprise (SoE) following a year of ups and downs with the management and workers issues. In a meeting with the Energy Workers Union today, workers claim that the instability has taken its toll resulting in very slow delivery of services, also compromising their safety at the work place. Another matter brought up at the meeting is the Enterprise Agreement that they want the Union and management to address soon. Union President Edward Gisa said this particular matter is currently being discussed with the management. Meantime, workers also demand to know the outcome of the investigation into suspended CEO John Tangit, which they claimed has gone for far too long.